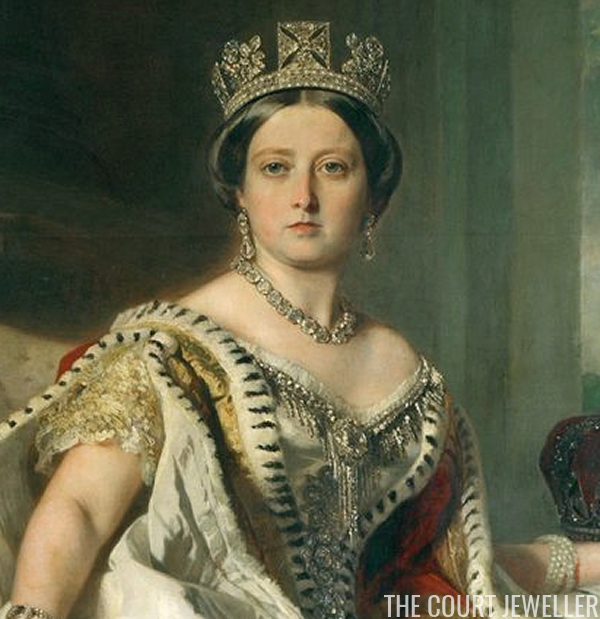 One of the grandest, most glittering ornaments in Queen Victoria's collection was today's diamond fringe brooch -- but, believe it or not, it used to be even grander! Here's a close-up of the ornament from an 1870 copy of a Winterhalter portrait. Have a look at the neckline of her gown. See the fringe that runs along the entire border, getting longer in the middle, with the large diamond set in the center? That's the original chaine de corsage that Victoria ordered from Garrard in 1856. According to Hugh Roberts, the vast majority of the diamonds in the ornament came from a jewel that had been given to her by Sultan Abdul Mejid I of Turkey six months earlier. She noted in her diary that one of the jewels that the sultan had given her would "have to be reset," because it was simply too large to wear. It seems that this extraordinary chaine de corsage was the result of Garrard's subsequent work. The piece was made of diamonds set in silver and gold. When Prince Albert died, this ornament was one of the pieces that Queen Victoria quietly put away -- it was simply too glittering and elaborate for her mourning attire. Roberts argues that, in 1870, she actually had the piece partially dismantled, removing the fringes from either side of the central diamond, transforming the jewel into a much smaller fringe brooch. You can see the revised version of the jewel above; it still exists in this form today. 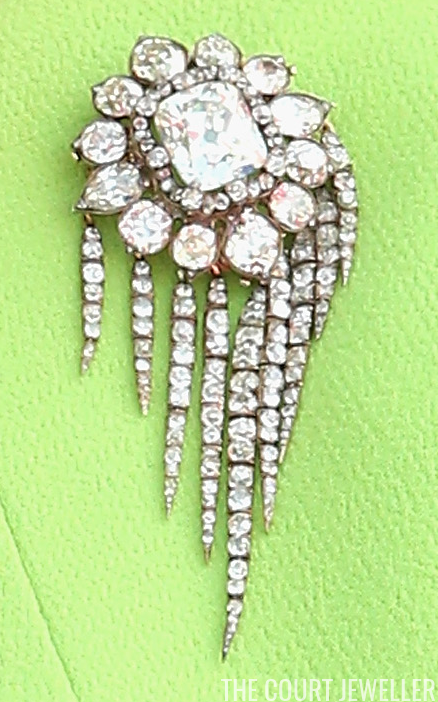 Roberts describes the piece as follows: "with a large emerald-cut brilliant framed by small brilliants (detachable as a separate brooch), surrounded by 12 large brilliants in cut-down open-backed collets, suspending nine graduated pave-set brilliant pampilles, or chains, each link of two stones." The diamonds from the dismantled fringe sections were probably used to make the small new diamond crown that she wore throughout her widowhood. Above, Queen Alexandra wears both the fringe brooch (pinned at the neck) and the small diamond crown. 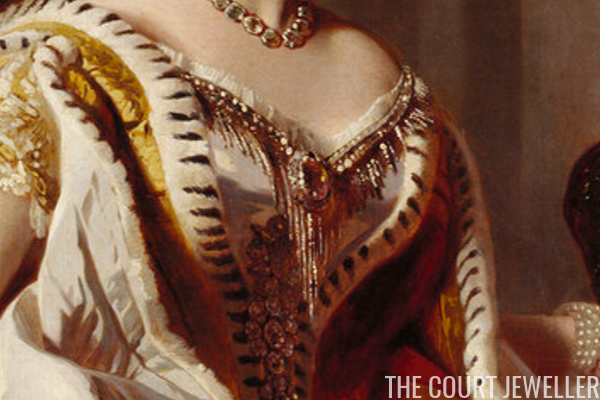 When Victoria died, she did not designate the brooch as an heirloom of the crown. Instead, she bequeathed it directly to her son, King Edward VII. 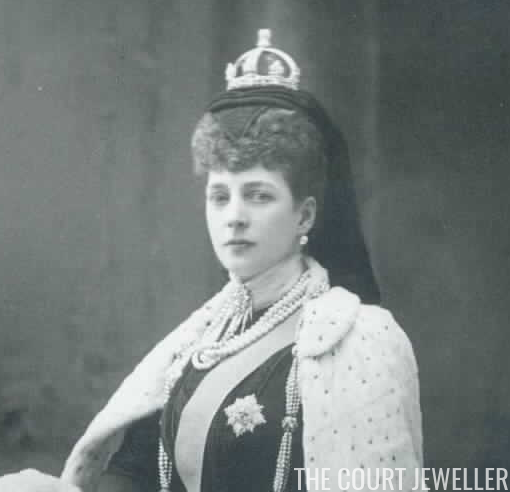 His wife, Queen Alexandra, began wearing the brooch almost immediately, and she kept it until her death in 1925. 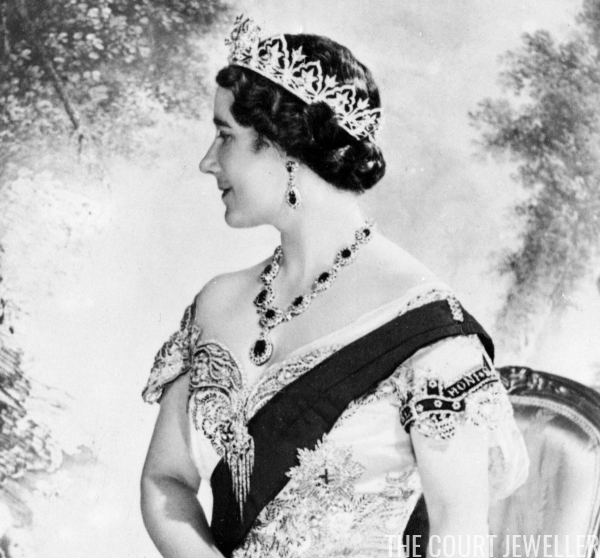 Queen Mary inherited the brooch from Alexandra, and in 1936, it was one of the jewels that she handed over to her daughter-in-law, Queen Elizabeth. Above, Elizabeth wears the brooch pinned to her Garter sash in a portrait taken around the time of her coronation in 1937. She also wore it for her daughter's coronation in 1953, and she kept it until her own death in 2002. 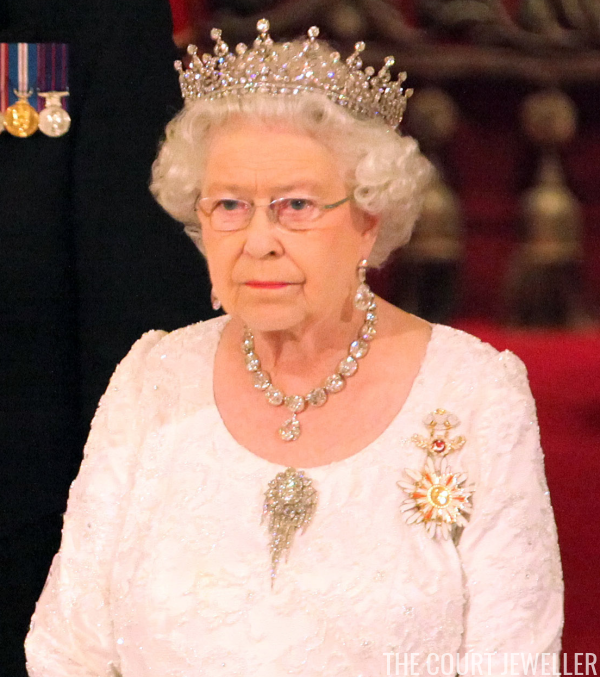 Since inheriting the fringe brooch from her mother fifteen years ago, Queen Elizabeth II has worn the large diamond jewel occasionally. Given its history, the brooch was a very appropriate choice for a state banquet in honor of the President of Turkey in 2011. Despite its size and wattage, the Queen has also occasionally chosen the piece for daytime occasions. 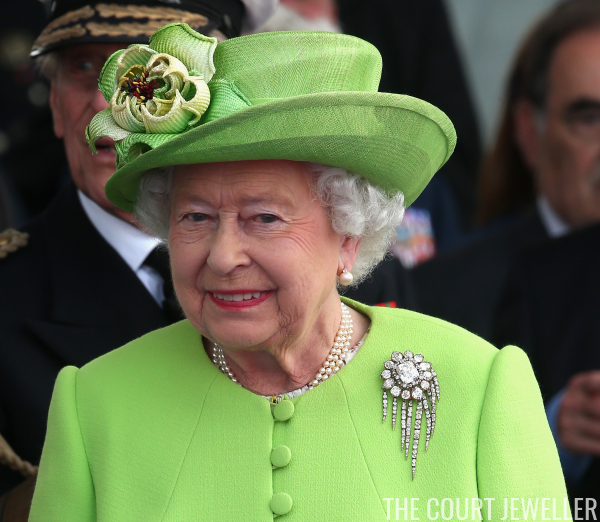 She wears the brooch above in France to commemorate the 70th anniversary of the D-Day landings in 2014.